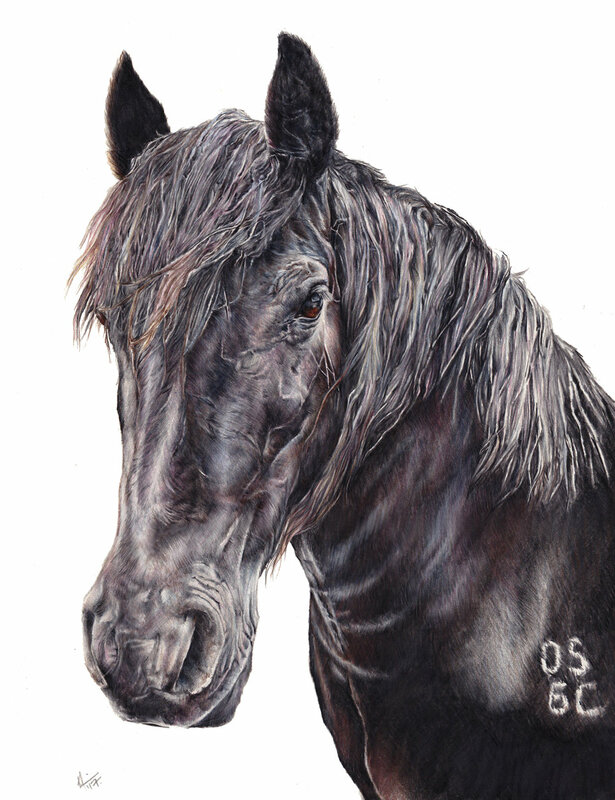 I create fine art portraits of a wide range of animals and wildlife in a variety of styles and sizes. Using mixed media - watercolour, pen and ink, acrylic and oils, each piece is painstakingly developed to get the best representation I can. 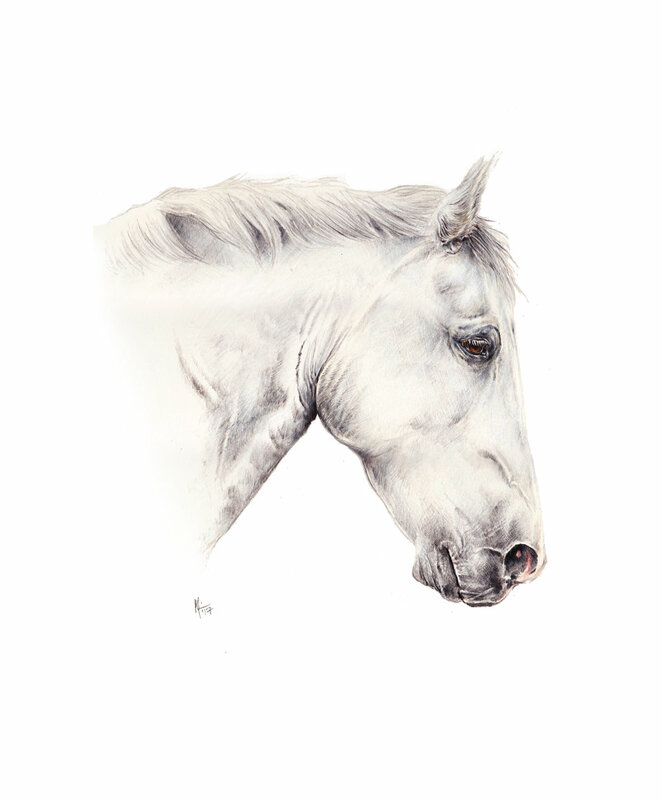 All artwork is painted on the finest quality archival papers and can be presented either unmounted or framed. Sizes vary from small A4 studies up to 180cm larger works, this depends on the subject and budget. 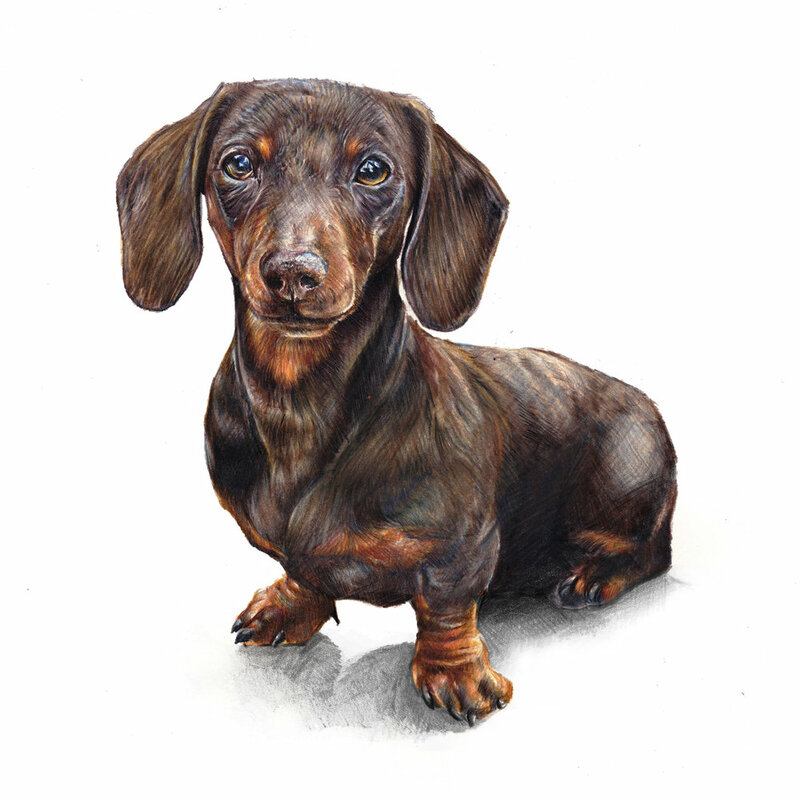 I aim to create a painting that you are thrilled with and love getting to know about my customers and their animals. This is such a personal undertaking and I will do my utmost to deliver. Get in touch with me by phone or email. We will chat about your requirements and I will give you the total cost and approximate timescale. I will ask that you send me some photographs, which we will discuss and pick the best ones to base your painting on. Please read my photography guide to ensure the best possible reference images. I will then get on with the painting, letting you know of my progress as I go. When the painting is complete, I will invite you to come and see it or send you photographs. If you are happy with the painting, I will request payment and the painting is yours. The cost will depend depend on your individual requirements of size, medium and any mounting or framing options. Prices have ranged from £195 for an illustration up to £1,800 for a very large, complex mixed media piece. Please don't hesitate to ask and I'll do my best to accommodate your budget. Payment is due when the artwork is finished and only if you are completely happy with it. I cannot emphasise enough that the better the image you give me, the better the portrait will be. Ideally, I like to be able to choose from multiple images of the subject. Group portraits are possible and can be combined from separate images. Please read these guidelines and suggestions on getting the best images of your pet/loved one. How long does a portrait take? I can't give you an exact time as it depends on the time you have booked your portrait. Leading up to Christmas I am very busy so you need to book well in advance as it may not be finished for then. If there is a certain deadline I will try and get it finished a week before then so you have plenty of time to wrap it up. I only accept payment once you are happy with the painting. I have never asked for a deposit as I trust my clients fully to send me full payment once it is complete. I can only draw as well as the reference photos provided. Read my Photography Guide to fine out more. I need one image that you would really love drawn and then a few others to give me an idea of personality of the animal. Do I need both pets in the same photograph to work from? 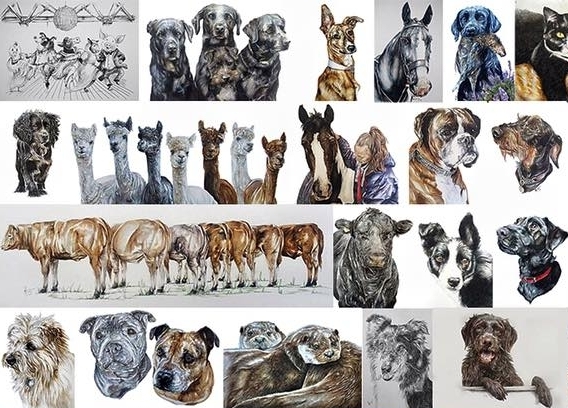 No, you can have separate photographs of your pets and I bring them all into one portrait. As long as they are good quality photographs there won't be a problem. I love getting three or four different subjects and incorporating them together on a piece - seeing it come together is very satisfying. I live abroad, do you ship internationally? Yes, I ship all over the world. There will be an extra cost to this but not as much as you think. It normally takes around 2 – 3 weeks to get to you so make sure you leave plenty of time to book your portrait. Get in touch and I will give you an estimated price. 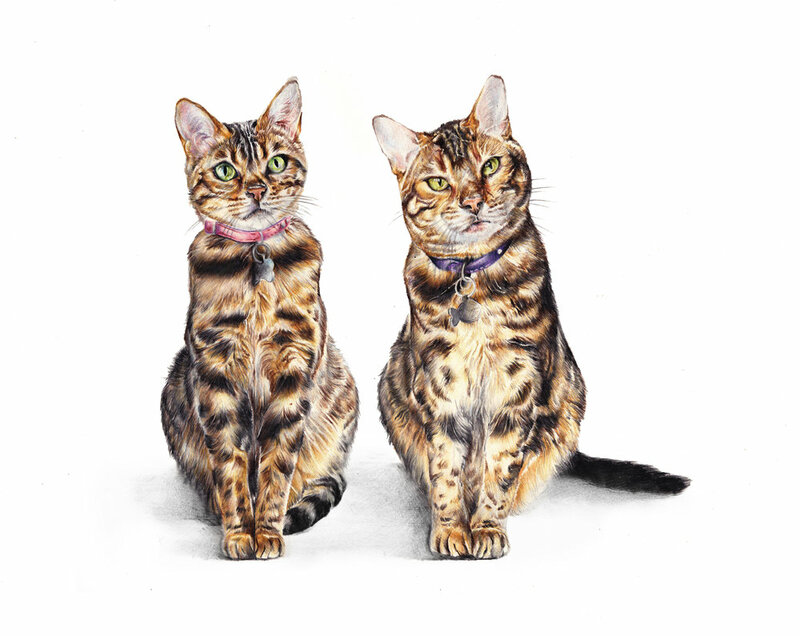 Do you paint other subjects other than animals? Yes, I do. I have done landscapes and people portraits, illustrations for albums and completed some corporate commissions. If you have an idea in mind, why not get in touch for a chat?